The proposed changes to the Brazilian Forest law were on the agenda of the first day of debates and workshops at the 2012 World Social Forum. 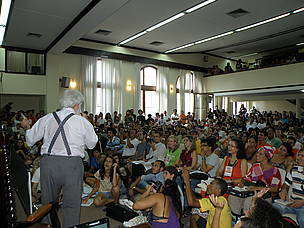 During the debate held at the Federal University of Rio Grande de Sul’s Faculty of law, former environment minister and senator Marina Silva declared that pressure from the Brazilian people will be fundamental to ensure that president Dilma Rousseff vetoes the highly retrograde measures embedded in the legal text of the draft bill approved by the House of Representatives and the Senate in 2011. “Dilma made a commitment signed in her own hand, to veto any project that stimulates more deforestation or grants amnesty for illegal deforestation. Society now needs to give her the political backing she needs so that she can honour her campaign promises”, declared Marina to an auditorium packed with students, environmentalists, integrants of the social movement and journalists. The former senator classified the version approved by the senate and now being re-submitted to the House for further analysis, as a “festival of retrograde provisions that will place the planet and life in the cities in jeopardy”. The discussions took place during the roundtable ‘Rio + 20 and Sustainable Cities” which addressed the preparations for the upcoming event that will mark the 20th anniversary of the Rio-92 conference. Other participants in the debate were theologists Leonardo Boff and Frei Betto, businessman Oded Grajew, one of the idealizers of the World Social Forum, the president of the Ethos Institute, Jorge Abrahão, the former director for Forests of the Brazilian Ministry of the Environment, Tasso Azevedo, economist Ladislau Dowbor and architect Nabil Bonduki. Former senator Marina Silva will be attending another round of debates at the World Social Forum this time as part of the roundtable promoted by the Committee in Defence of the Forests. The debate will take place at 9 am on January 26 in the Rio Grande do Sul Legislative Assembly building. In addition to Marina Silva, WWF-Brasil CEO Maria Cecília Wey de Brito, the coordinator of the Landless Rural Workers Movement (MST), João Pedro Stédile, the director of Greenpeace’s Amazon Campaign, Paulo Adário, the director for social movements of the National Students Union (UNE), Rodolfo Mohr and Federal Deputies for São Paulo Ivan Valente (Psol) and Paulo Teixeira (PT), will all be attending the debate as well as representatives of the Brazilian Society for the Advancement of Science (SBPC) and the National Conference of Brazilian Bishops (CNBB). President Dilma Rousseff has also been invited but has not confirmed her attendance. Admission is free and by order of arrival.